Work is still continuing on "Broken Glass". Here is how the week went as far as hooking. I started filling in the outlines hooked last week on the lower blue areas. The blue here is slightly grayer than the blue above it. Outlines were filled in on rest of the left hand side, then on right hand side. I ran short on the blue-gray wool being used and decided to add a different shade rather than dye up a perfect match. There were shadows and reflections all over the actual window and various shades work better to depict this. 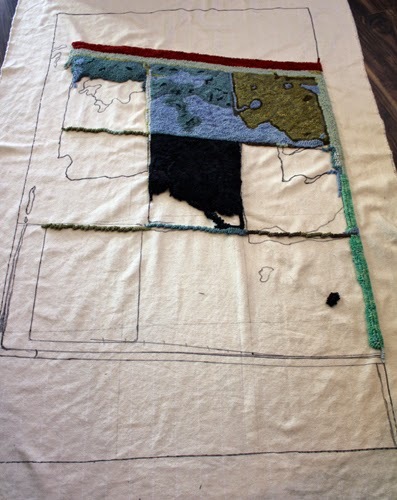 I moved on to the upper right hand side and added a medium and dark green. The upper dark corner will balance out more of the black that will be added in the lower half of the piece. Sometimes a little can do a lot. It is hard to see here, but more light blues were added on the left. They don't show up well against the white monk's cloth. 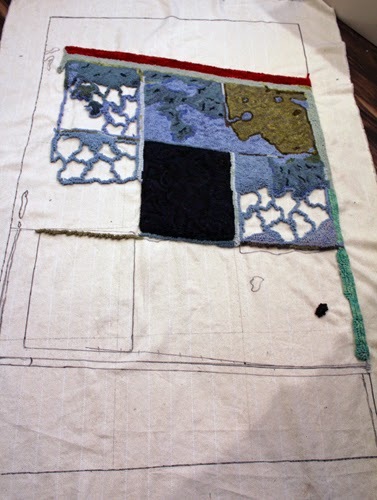 The piece is coming together and I'm getting excited about seeing it done. Here is where the piece is at now. 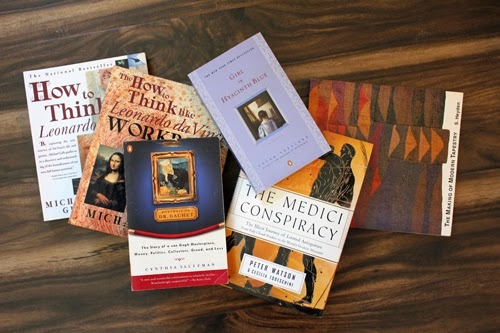 A little fiction, a few workbook exercises, some non-fiction, plenty of painkillers (not shown) and dreams of Pinot Grigrio as soon as that is a possibility. Kathleen Turczyn- Kathleen is a painter creating beautiful landscape scenes as well as portraits and animals. Her new website is still under construction, but you can get to the gallery pages. 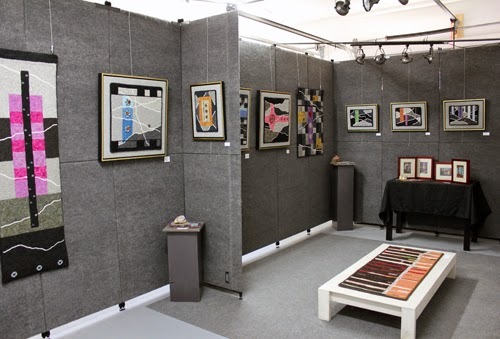 Louise Oppenheimer- Louise is a tapestry artist. My husband and I purchased one of her works on our trip to Scotland. She has a distinctive style that portrays the nature around her beautifully. 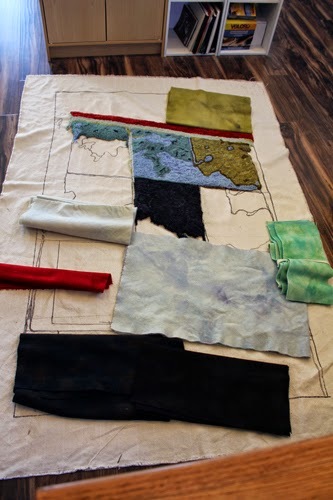 Alicia Keshishian- Alicia is a rug designer and color expert. I met Alicia when she was an instructor at Penland. 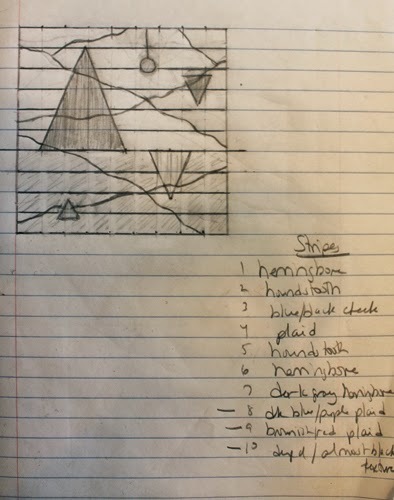 Working with her to design a rug for our home was a wonderful experience. Simona Rosasco- Simona is a glass artist. She creates both functional and decorative glass art. Her work first caught my eye a while back due to the use of stripes (we all know I love those!) in some of her pieces. I may not be posting for a couple of weeks, depending on how recovery goes. Enjoy exploring art on social media, participate in challenges if you'd like to and have a great day. 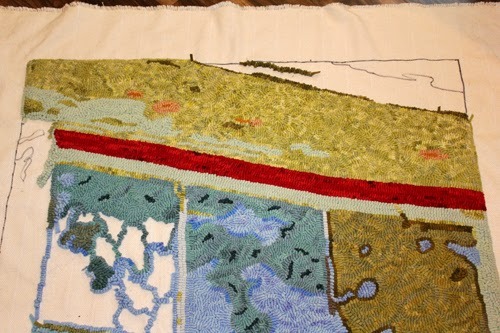 The countdown to wrist surgery has begun and I"m dividing up "Missing Glass", a 36" X 60" piece, to see if I will be able to complete the hooking process before the surgery date of February 6. That gives me 13 days (as I write this). 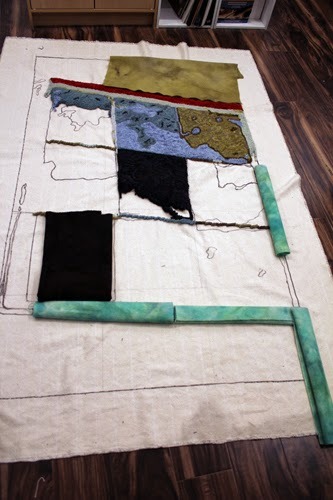 If the unhooked sections are divided into 13 parts there are some full days of hooking and dyeing ahead. This week the upper section was filled in with three light greens: a value 1 spot, a value 3 spot and a solid. 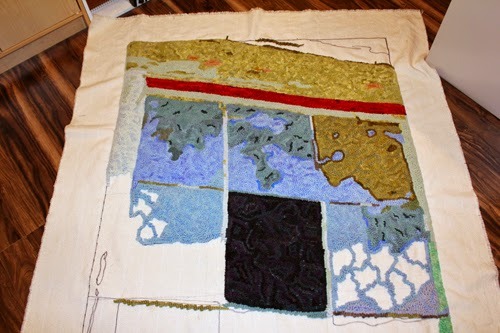 A medium green will go above that on the diagonal and a dark green in the upper corner. 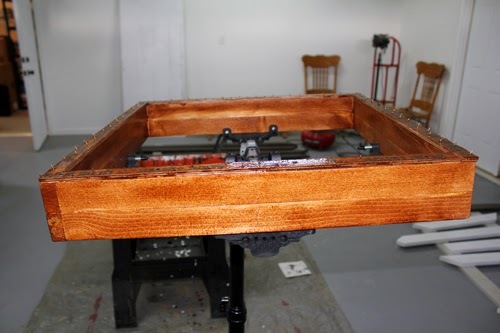 New frame sitting in the workshop waiting for stain to dry. Pete and I are working on creating various size frames for hooking with an easel. This is the third Pete has put together for me. 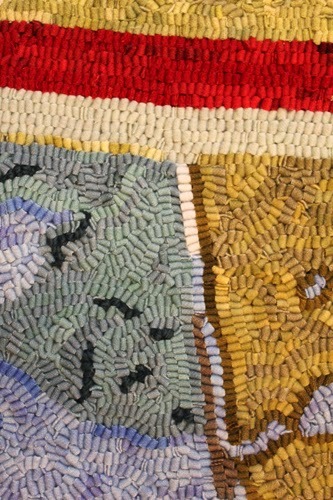 Happy in the studio with a rug punch. No make-up and serious expression. I have priorities. One of the new frames was put to use this week. "Mountain Reflections", a 20" X 20" work, was started. 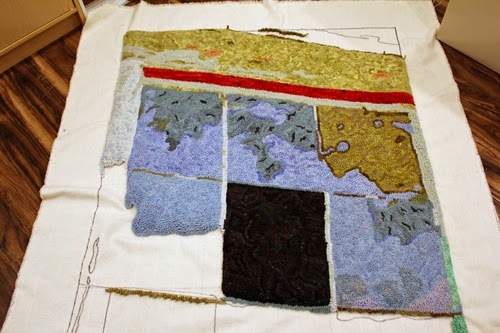 The reason for starting this piece while still working on the larger one is to practice rug punching with my left hand to be ready to work after surgery. Trying to use a hook solely with my left hand just was not working out. 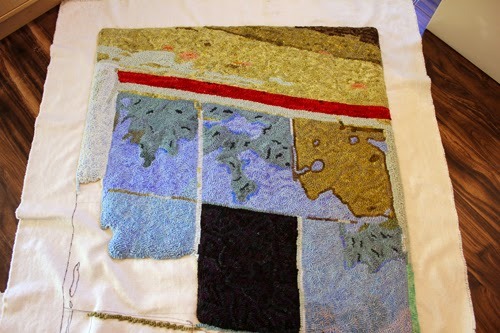 I'm still working on inserting the wool into the punch needle with left hand only. The operation I will be having is called a proximal row carpectomy. Three bones in my right wrist will be removed due to a completely torn ligament and bone rubbing against bone, which is pretty painful right now. I will end up with limited movement but no pain. I'll see how recovery goes. 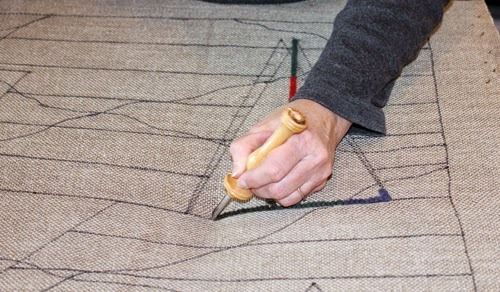 I have never punch hooked before, other than a quick practice round with Melina White at the Green Mountain Rug Show, and found it quite simple to adjust to with my right hand. When I switched to practice with my left it only took a few minutes to get used to it. Looking forward to working in a new way. This is the Oxford punch needle created by Amy Oxford. 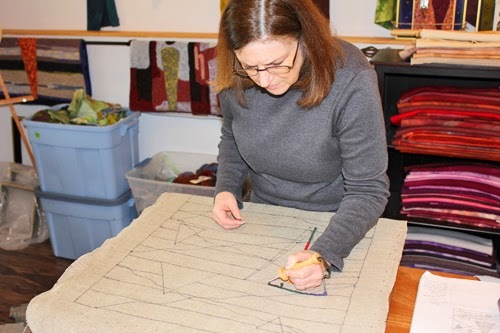 Textileartist .org has a good article on the mind-set of professionals here. It mentions adversity and determination. You may have to change the way you do things, but you can be creative no matter what. Don't let anything stop you. 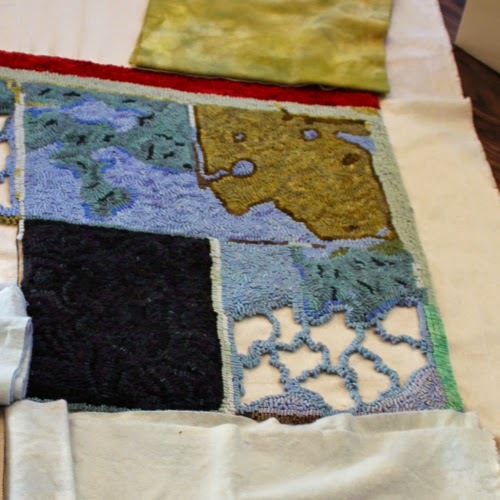 Give rug punching or other rug techniques (braiding, shirring, standing wool, proddy, etc.) a try and have a great day. The latest piece has finally received a title. I had to think about what really drew me to take the photo of this old window in the first place and it was the two missing glass sections. Most of the abstract pieces I work out in my head start with a title from which the idea develops. Pieces I work out from photos or actual things that I have seen tend to be titled after the piece has started. Not sure why this is. Possibly because, for the latter, the visual is already there ready to work on rather than imagined. Larger pieces can be a bit overwhelming at times. I like to break them down into sections and then each section gets broken down as it is being hooked. The majority of this work is done in a meandering manner which allows me to set up the outlines and then fill them in making each section seem to move along faster and giving me a solid idea of how the color fits in with the overall work. This week was also filled with moving the gallery section of the studio. I have downsized the area for winter. Older works had been hanging in the work section, but since this is the area people enter first it is in the process of being updated to show the direction my work is currently going in. 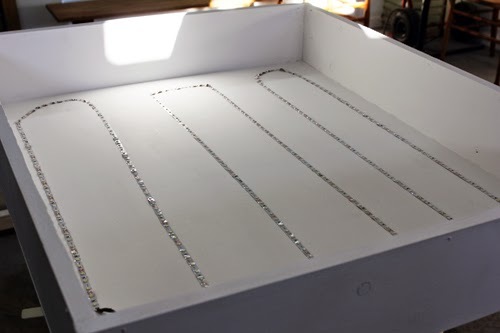 A box section was pieced together and self-adhesive super bright led light strips were attached to the bottom of the box. We used thin wood for the bottom and 3/4 inch wood for the sides. 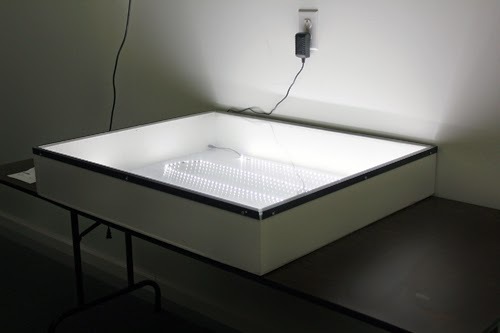 The box measures 30" X 36" to fit the measurement of the glass and acrylic for the top. A hole was drilled into one side edge for the lighting. Metal L-bars were cut to size and spray painted. Glass and acrylic were placed on top and the L-bars were screwed into the sides. Here it is lit up and ready to go. There is even a remote control for the lighting. We all face adversity at one time or another. If slowing down is an option, enjoy the time to relax. If it is not an option, think of how you can make things easier on yourself and have a great day. 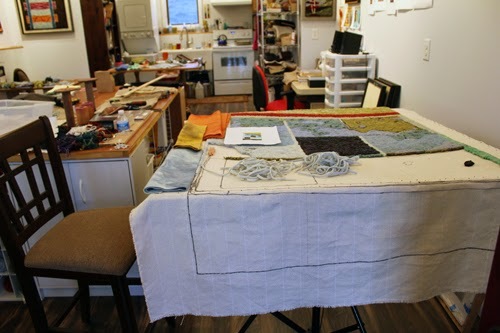 The holidays are over and I finally returned to the studio this past Wednesday. The window piece is starting to take on some character and I can see the direction it is going in. I'm still debating on whether the darker green spots placed in the turquoise are working or not. I don't like to pull things out too early so I'm still waiting on this one. This also gives me time to think of possible options, rather than rushing. 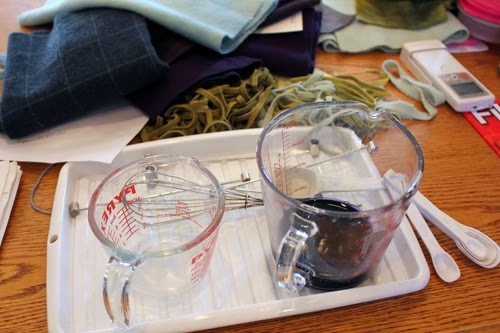 Though there is plenty of wool on the shelves of the studio, there was no light blue, so it was time to hit the dye pot. Here you can see the light blue middle left. I used the lightest shade in the formula and halved it. A more mottled blue was also dyed. 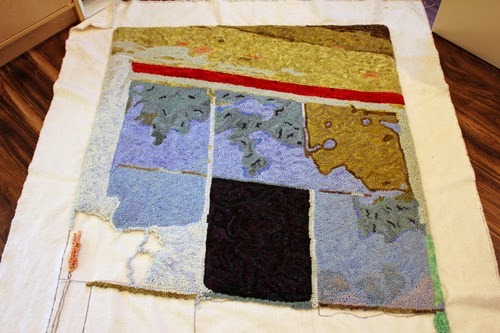 These two values of wool will be hooked together in the areas requiring a light blue to add variation. More color placement was done. The mint green is brighter in reality than the photo shows. 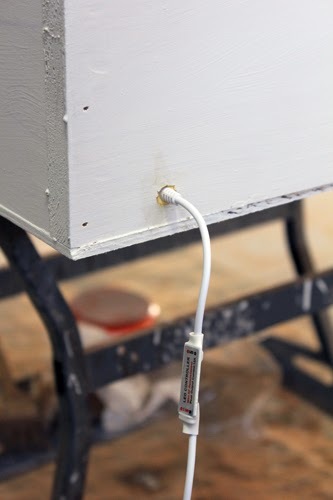 It is a color that will add a little punch to the work along with the red. I also wanted to see if the blacks were going to balance out o.k. and they will work out perfect. Another piece in the Road Series was planned out this week. The focus of this work is the mountain roads. I also thought of the reflection of the mountains in local lakes and added this to the design with the reflections being offset in the lower half. Chain and metal will hang from the top. 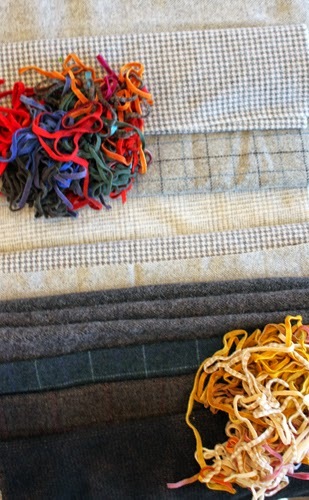 The bottom right shows my list of the order that the gray background will be hooked in. 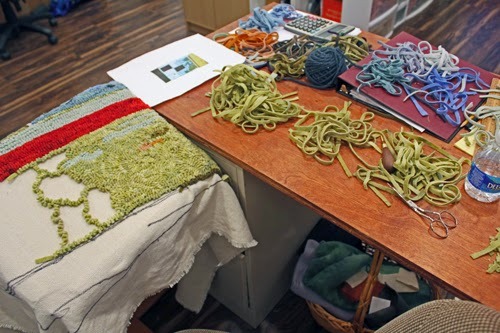 The gray wool was laid out on the studio table and various strips were chosen. Darker strips were chosen to show up on the light grays and lighter strips to be hooked against the dark grays. I'm thinking of hooking the triangles vertically to contrast with the horizontal gray stripes which will be hooked randomly. Almost everyone that came to the studio tour in December mentioned how neat and clean the studio was with everything in its place. Needless to say, the tour is over and I couldn't resist taking this photo. 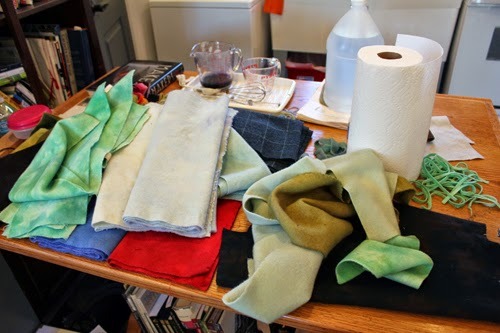 The dye table is once again in work mode. There is always chaos before calm in this workplace. When designing and hooking, focus on your work, forget about the mess being made in the process and have a great day.